The Lehigh Valley operated a yard and ferry operation from 27th Street. Much if this was enclosed in the 20-story Starrett Building after the structure opened in late 1931. While Dave is not modeling the actual Starrett Building, he does use a thick sheet of white plastic to represent concrete loading docks that were alongside mush of the LV trackage inside the Starrett Building. 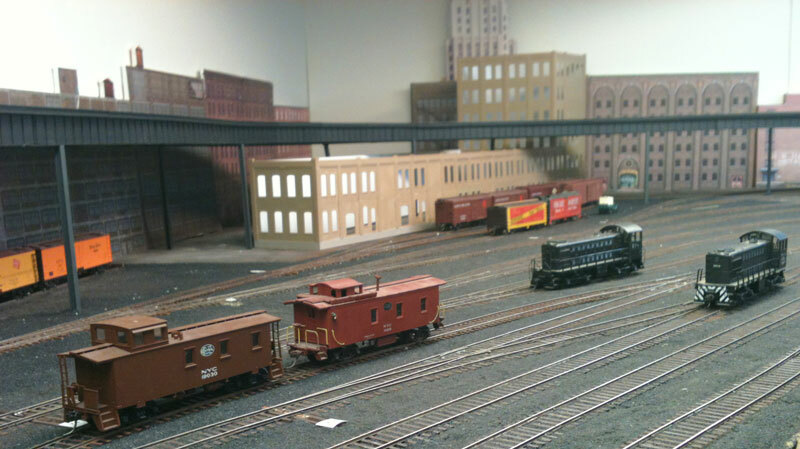 Just north of the LV operation is the Erie Railroad’s 28th Street Yard. The Erie operated a freight house here and also served the large Terminal Stores building. Dave has used Photoshop to reproduce the facade of this imposing structure. 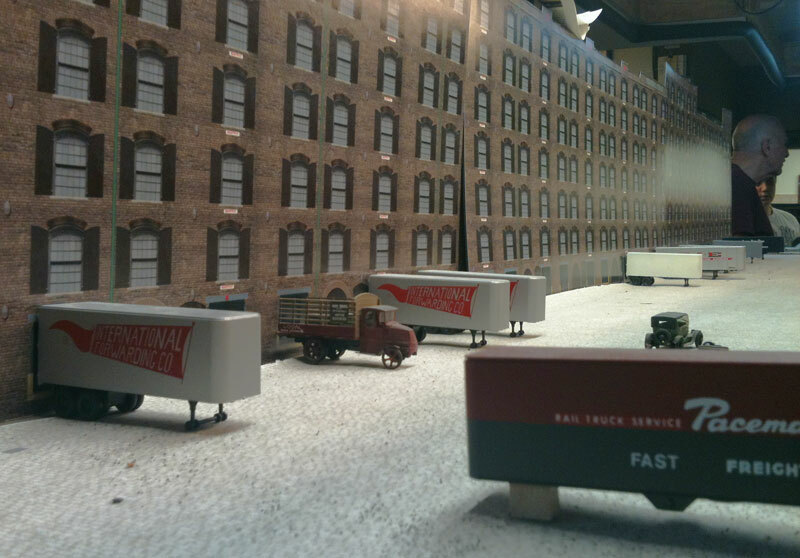 He is well along in modeling the urban canyon between the Erie Freight House and the Terminal Stores building. Shorpy has featured a 1912 image that captures a portion of the Terminal Stores building and a bit of the Lehigh Valley yard, as it looked before the Starrett Building construction. 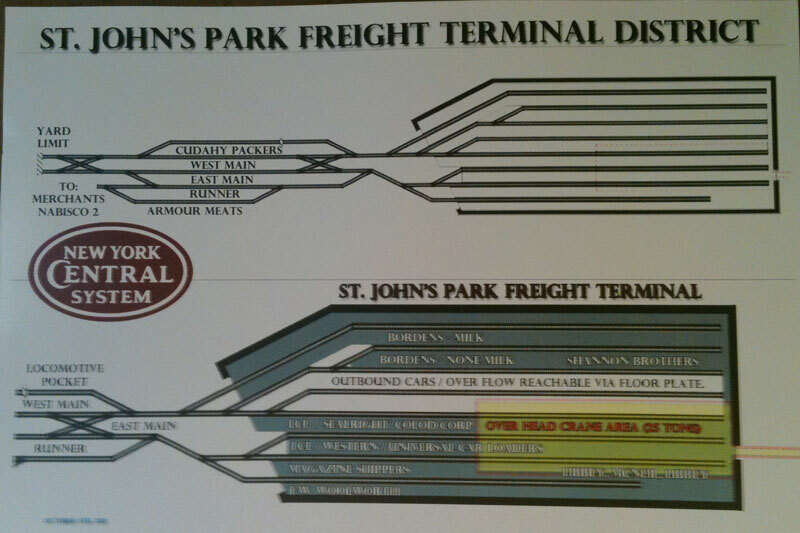 The Terminal Stores building had reciprocal switching by the Erie, LV and the New York Central. Dave has two parallel tracks inside the building with specific customer spots. The building sits at the aisle and the half you see on Shorpy is gone so operators can access the tracks for operation. The Shorpy image shows the south side of the building, while the image from Dave’s layout above shows the north side of this building. 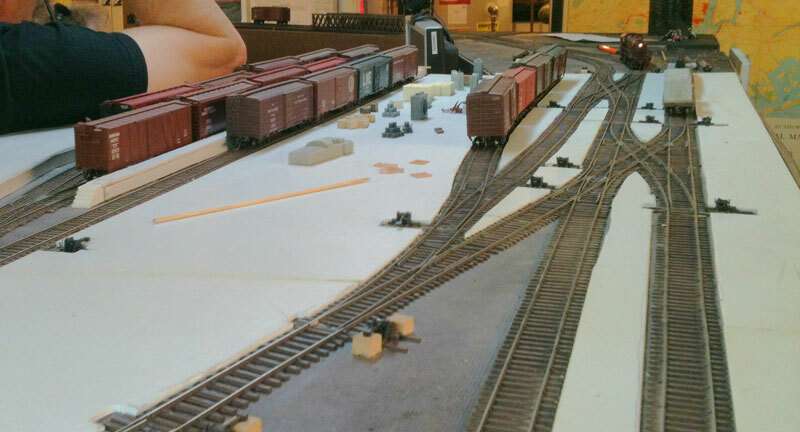 The layout features two float brides and barge spots for freight cars to enter and leave the layout via connections to the Erie and LV yards. 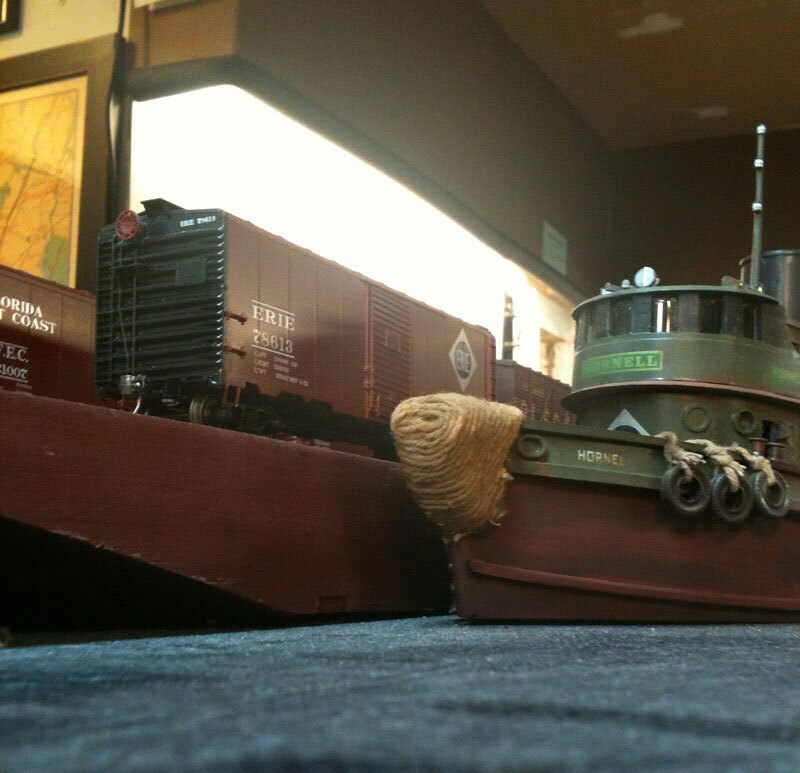 Here’s an Erie tug nudging a barge into place. 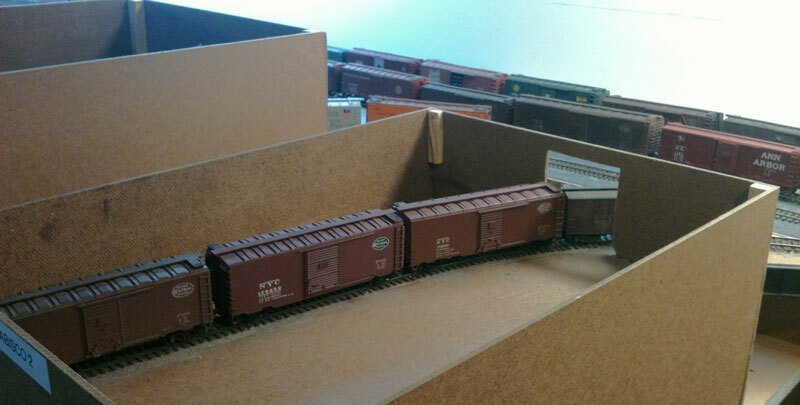 The third prototype modeled is the New York Central. Dave is actually modeling two portions of the NYC operations in this area. 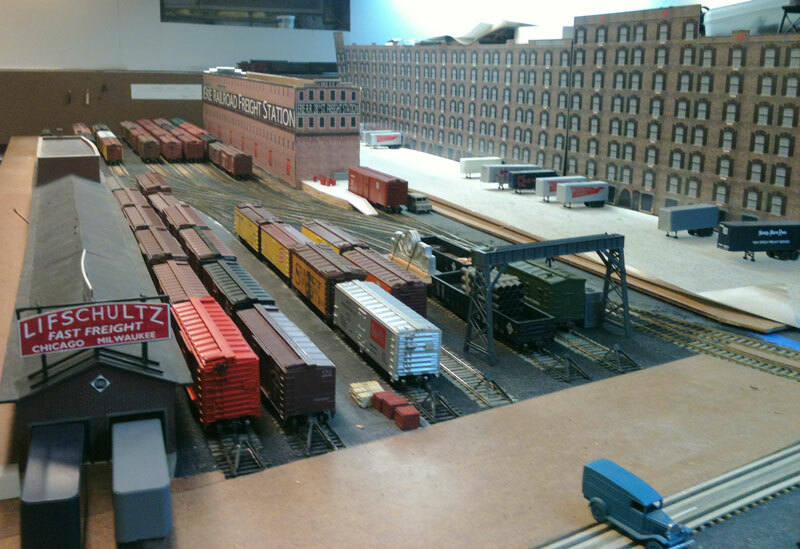 The 33rd Street yard was a busy hub of activity as this served several warehouses, a brewery, team tracks and a large freight house. The other aspect of the NYC is the High Line that was built to raise the NYC West Side freight line above street level. As I understand the NYC on the West Side, a larger yard at 72nd Street fed traffic to the NYC yard complex between 30th and 33rd Streets and to the High Line. 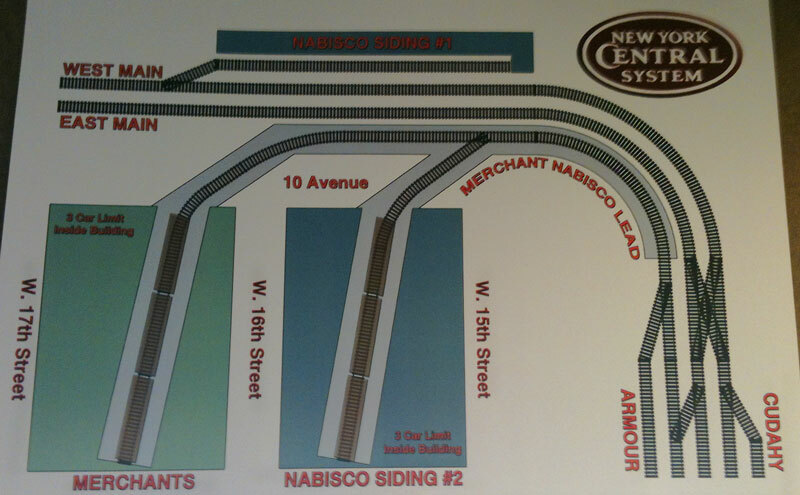 The High Line began at 34th Street and basically looped around the 33rd Street yard facility on a 4% ramp to gain the elevation needed, very much like a model railroad helix. 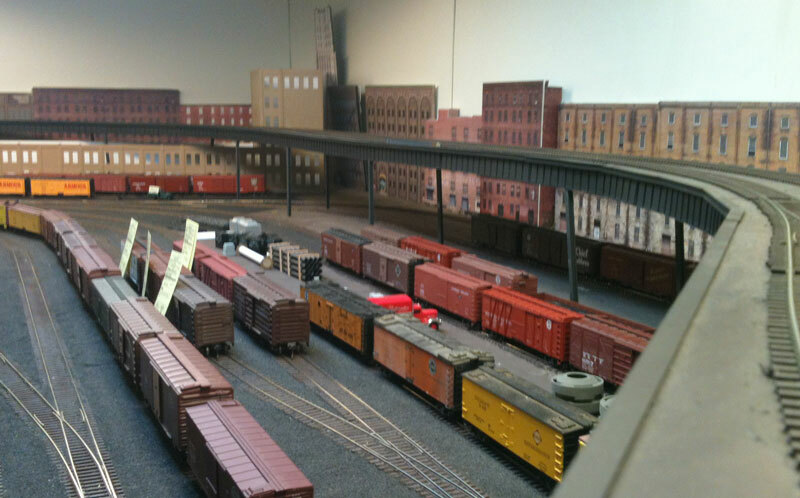 Dave does not have the room to recreate this element, so separate fiddle staging areas are used to feed the 33rd Street Yard and the High Line. Here’s an image taken from the High Line and looking over the 33rd Street Yard. The previous image was taken from the back left side of this image. The High Line serves industries along the way to the St. John’s Park Freight Terminal. A list of the prototype customers can be found on Dave’s website. 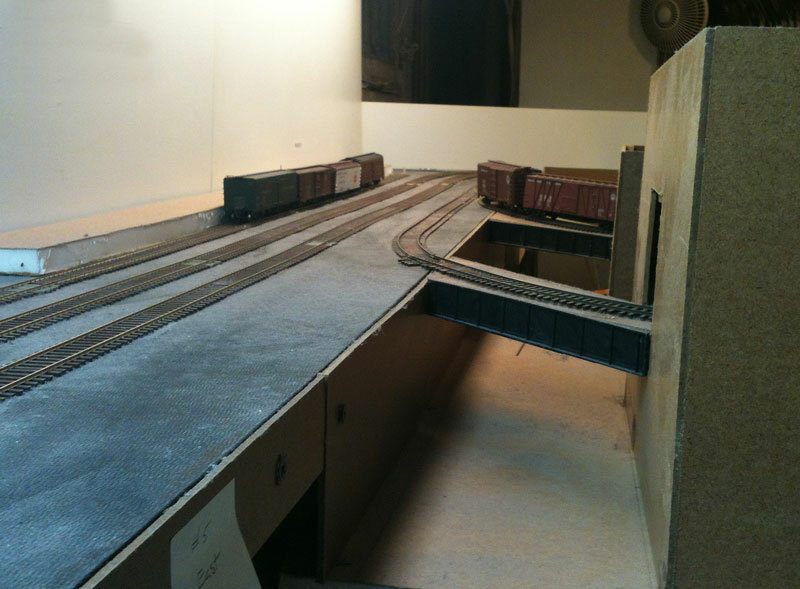 Model railroading is often about compressing the prototype and that’s what Dave had to do in order to fit the High Line to his space. His model High Line serves all but six of the prototype industries. Here’s an image of a classic view where the NYC spurs crossed over 12th Avenue to enter the Nabisco and Merchants Refrigerating Company structures. As mentioned, the High Line ends at the St. John’s Park Freight Terminal. This was another massive structure with most of the trackage enclosed. In this image, Jim Schweitzer is busy reviewing paperwork to pull and spot cars from numerous Terminal locations. 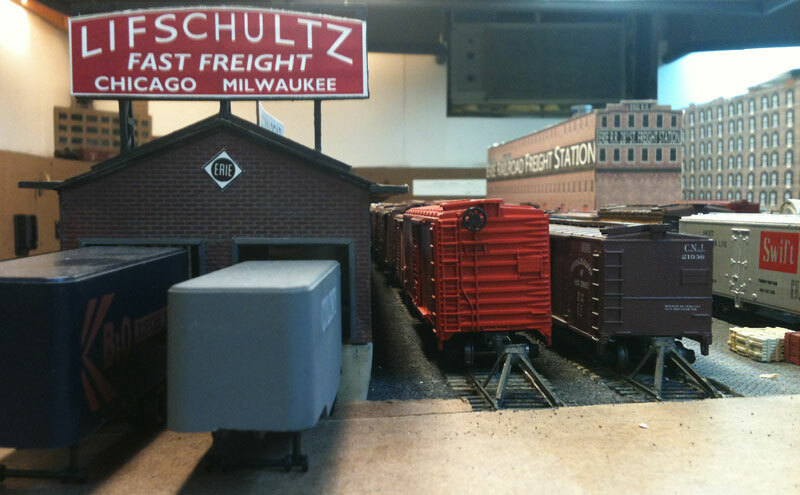 On the far left a reefer is spotted on the Cudahy Packers siding while the camera is just over the Armour Meats siding. Dave has a number of operational aids posted on the lighting valence. As nearly all industrial tracks have multiple spots, these aids are vital for efficient operations. Here’s what hangs just over the St. John’s Park Freight Terminal. Another operational aid is posted above the Nabisco operating area. Dave uses car cards for freight car movements, but these are highly interactive. When a car is spotted, the crew must write the spot time on the card. 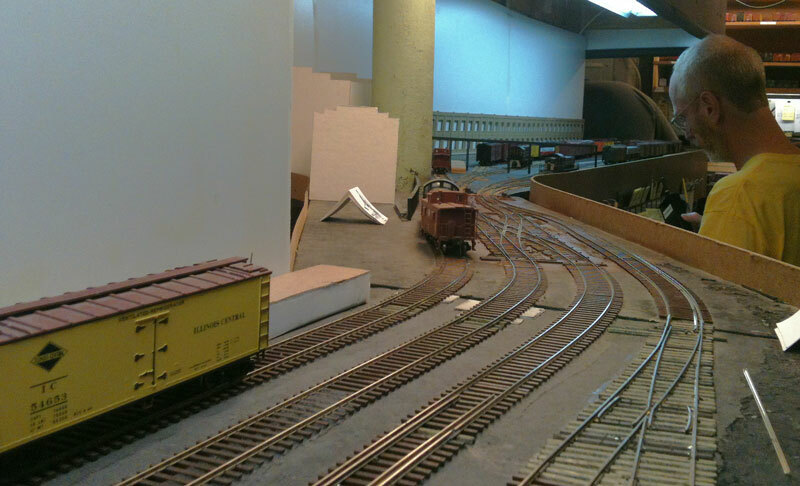 As the session proceeds, Dave or an assistant will review cards for spotted freight cars. Each car card also has an estimated time noted for the car to be emptied. Some cars and industries take longer to unload than other cars or industries, so not every unload time is the same. If the unload time is 90 minutes, and the car was spotted at 8:30, then it would be en empty at 10:00 and could be pulled. This is something crews need to understand as Dave did not always make the rounds. There were several moments late in the session where I had to calculate if a freight car was empty or not. If empty, I would pull the car, strike a line through the car card and turn it over to the empty side. All empty cars and car cards were handed off to the St. Johns Terminal yardmaster so he could gather those and send them back to the 72nd Street Yard. In addition to the car cards, a crew would receive a train description that would note the jobs required along the run. This was hardly a 3×5 card and was important for traffic flow. There were no train orders on the High Line as it is all within yard limits. Speeds were never extreme and visibility was pretty good over much of the double tracked route. This layout was a pleasure to run. Many of the locos had sound and I was paired up with a conductor to enable easier switching. Some trains are 20-25 cars long, so having someone on the back end for long distance spots and pulls was handy. We would also discuss moves before executing the work. It was a great learning experience and I hope to return for another session. Many thanks to Dave for inviting me to his op session and granting permission to capture the layout images. Readers are welcome to comment. Please leave a comment below. All comments are reviewed and approved before they appear here. Next Next post: More Hopper Madness!